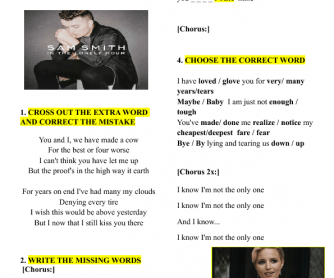 I created this worksheet with a new song called I'm not the only one. It is slow and easy to follow. However, the exercises I planned for it are not. They are meant for pre-intermediate level students or a very good beginner group. There are different exercises: complete, unscramble, cross out and correct. I hope you like it!